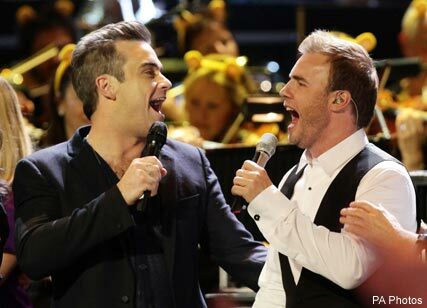 It’s the moment we’ve all been waiting for, sort of, Robbie Williams singing with Take That. Take That performed to a packed-out Royal Albert Hall at a special charity gig for Children In Need last night. After their short set Gary introduced Robbie with, ‘What a perfect night for us to introduce an old friend.’ Robbie walked on and looked overwhelmed as he hugged Gary, Mark, Howard and Jason. Fans screamed for them all to sing a Take That song but the boys left the stage to let Robbie sing his new single Bodies and You Know Me. At the end of the show Paul McCartney bought all the performers together, including, Cheryl Cole, Lily Allen and Leona Lewis, to sing a stunning version of Hey Jude, and fans got their chance to finally see Robbie and Take That sing together, albeit with an all-star cast of backing singers! SEE CHERYL ON STAGE – PLUS MORE CONCERT PICS HERE!